I'm moving the discussion of this passage out of the ὅσα thread for clarity. It may even spawn other threads in the future. ἀνίστησιν οὖν ἐκ τῶν Ὀδρυσῶν ὁρμώμενος πρῶτον μὲν τοὺς ἐντὸς τοῦ Αἵμου τε ὄρους καὶ τῆς Ῥοδόπης Θρᾷκας, ὅσων ἦρχε μέχρι θαλάσσης [ἐς τὸν Εὔξεινόν τε πόντον καὶ τὸν Ἑλλήσποντον], ἔπειτα τοὺς ὑπερβάντι Αἷμον Γέτας καὶ ὅσα ἄλλα μέρη ἐντὸς τοῦ Ἴστρου ποταμοῦ πρὸς θάλασσαν μᾶλλον τὴν τοῦ Εὐξείνου πόντου κατῴκητο: εἰσὶ δ᾽ οἱ Γέται καὶ οἱ ταύτῃ ὅμοροί τε τοῖς Σκύθαις καὶ ὁμόσκευοι, πάντες ἱπποτοξόται. παρεκάλει δὲ καὶ τῶν ὀρεινῶν Θρᾳκῶν πολλοὺς τῶν αὐτονόμων καὶ μαχαιροφόρων, οἳ Δῖοι καλοῦνται, τὴν Ῥοδόπην οἱ πλεῖστοι οἰκοῦντες: καὶ τοὺς μὲν μισθῷ ἔπειθεν, οἱ δ᾽ ἐθελονταὶ ξυνηκολούθουν. ἀνίστη δὲ καὶ Ἀγριᾶνας καὶ Λαιαίους καὶ ἄλλα ὅσα ἔθνη Παιονικὰ ὧν ἦρχε καὶ ἔσχατοι τῆς ἀρχῆς οὗτοι ἦσαν: μέχρι γὰρ Λαιαίων Παιόνων καὶ τοῦ Στρυμόνος ποταμοῦ, ὃς ἐκ τοῦ Σκόμβρου ὄρους δι᾽ Ἀγριάνων καὶ Λαιαίων ῥεῖ, [οὗ] ὡρίζετο ἡ ἀρχὴ τὰ πρὸς Παίονας αὐτονόμους ἤδη. μέρη = ἔθνη. κατῴκητο— this use of the mid. of persons is found only in Herod. and Thuc., and is confined to perf. forms. Dion. Hal. finds fault with Thuc. for using the mid. where Attic writers use the active. But is this right? μέρη roughly means "lands". ἔθνη roughly means "tribes". Marchant reads the one as the other and then following Dion. Hal. suggests that Thucydides is incorrect to use the m/p. Marchant is perhaps motivated by  where Thucydides introduces the word ἔθνη. But that is later. And perhaps Marchant is motivated by the idea that ἀνίστησιν in the sense of "levy" applies to people. This week, I have already claimed that Marchant botches another item and that Smyth is quite possibly confused. I am willing to go for broke and claim that Dion. Hal. doesn't know what he is talking about either. And why isn't Marchant required to give a reference for Dion. Hal.? What kind of scholarship is this? Anyway, any thoughts on this preliminary matter? Am I missing something basic? pster - apologies for the late reply, amd for the fact that it's somewhat perfunctory. - when you suggest 'rose to action' for ἀνίστησιν, do you mean it's intransitive? I don't see how it can be, or how this would work in the run of the sentence. Did you mean 'rouse to action'? - Thucydides not infrequently refers to (e.g) places when the rest of the sentence clearly shows he is thinking of the people who inhabit them. You cannot strictly rouse up a place, only its inhabitants, which is why I translated ὅσα ἄλλα μέρη as 'the peoples of all the other parts' (though a more literal translation would just be 'all the other parts'). - Like Rusten, I take κατῴκητο to be passive, not middle, and I don't know why Marchant mentions the middle. But you're right that, since it goes with μέρη, it's somewhat unreasonable to criticise Thucydides for using it of persons. - Bear in mind that Marchant was writing for Victorian schoolboys, few of whom would ever have been likely to disturb the pages of Dionysius of Halicarnassus, and so I don't find the omission of a specific reference surprising. - I also think you're being rather hard on Smyth. Identifying a couple of points of disagreement (or even errors) doesn't suddenly turn his Grammar into a bad book - the same sort of thing could doubtless be found in any very long and highly technical work. I used to have Goodwin's Greek Grammar - while not quite as full as Smyth, it might be worth trying as an alternative. 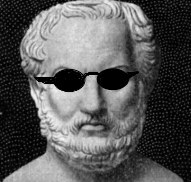 - I have somewhat more sympathy with your views on Dionysius of Halicarnassus, who tends to judge everything from the perspective of whether it can be recommended as a model for rhetoricians; his Second Letter to Ammaeus does, however, offer some interesting comments on Thucydides' style. John W. wrote: pster - apologies for the late reply, amd for the fact that it's somewhat perfunctory. Argh. I should have said "raised to action". John W. wrote: - Thucydides not infrequently refers to (e.g) places when the rest of the sentence clearly shows he is thinking of the people who inhabit them. I was thinking "raise up". We could also translate it as "call up". John W. wrote: - Like Rusten, I take κατῴκητο to be passive, not middle, and I don't know why Marchant mentions the middle. But you're right that, since it goes with μέρη, it's somewhat unreasonable to criticise Thucydides for using it of persons. My question is more direct. When Marchant says, "μέρη = ἔθνη", is that right? The rest of what he says I think follows from that. If μέρη = ἔθνη, then when he gets to κατῴκητο he can't read it passively since we are talking about tribes and tribes aren't inhabited, rather they inhabit. And he can't read it actively since it isn't an active verb form. So that leaves some kind of middle. But why say μέρη = ἔθνη in the first place? It is one thing to say Thucydides uses places (place names?!) when thinking of people. It is quite another say μέρη = ἔθνη as though it were a semantic fact. John W. wrote: - Bear in mind that Marchant was writing for Victorian schoolboys, few of whom would ever have been likely to disturb the pages of Dionysius of Halicarnassus, and so I don't find the omission of a specific reference surprising. Point taken. But in defense of those schoolboys, they were probably more likely to disturb said pages than almost any other group of schoolboys. John W. wrote: - I also think you're being rather hard on Smyth. Identifying a couple of points of disagreement (or even errors) doesn't suddenly turn his Grammar into a bad book - the same sort of thing could doubtless be found in any very long and highly technical work. I used to have Goodwin's Greek Grammar - while not quite as full as Smyth, it might be worth trying as an alternative. Haha. I never said Smyth was a bad book. I'm just having a bit of fun trying to get you and Nate and whomever else a bit roused up and a bit raised up to action. I figure after 20 hours and nearly two weeks trying to understand a handful of sections, I have earned the right to shoot a few spitballs. Smyth seems to have much much more detail, at least on this subject. John W. wrote: - I have somewhat more sympathy with your views on Dionysius of Halicarnassus, who tends to judge everything from the perspective of whether it can be recommended as a model for rhetoricians; his Second Letter to Ammaeus does, however, offer some interesting comments on Thucydides' style. Haha. I wouldn't say I have any views on him. The only view I have is that he knew of some great beaches and I have found some great deals on vacations to them! OK, no more messing around. We can come back to that momentarily. Let's get down to business: Smyth 2532. He explicitly takes up the other ὅσα example from this page of Thucydides. 1) ὅσα in the Smyth example refers to ἔθνη. 2) Has an antecedent dropped out? 3) Has there been incorporation? 4) If so, why hasn't the incorporated element been placed further back in the relative clause? 5) If there has been incorporation, why is the adjective still in the main clause? 6) What are the minimal conditions for something to be a case of attraction? This is perhaps such a case. You see the two ὅσα sentences are different. One has a copula and falls under Smyth 2532. The other doesn't have a copula and so has to be handled by other Smyth sections such as 2522. I am hoping that by understanding the differences we will be able to understand the reversed word order, one of my original questions to John. When thinking about these sentences, there are four kinds of sentences: original Greek; expanded, unattracted, unincorporated, antecedents indicated Greek; translation of expanded Greek; stylish English. I am mostly interested in the second and third of these. I think Marchant's equation μέρη = ἔθνη is simplistic. In Greek (as in English) one can say (e.g) 'he roused the city/country to arms', when what one really means is that 'he roused the inhabitants to arms'; to that extent, and in relation to ἀνίστησιν, we can say μέρη = ἔθνη. However, when it comes to κατῴκητο, clearly μέρη must be accorded its literal sense of 'parts' (here = 'places'); thus Marchant's μέρη = ἔθνη is, at best, only half the story. With regard to ὅσα, I'm afraid I've been hors de combat for some days and have lost the thread of the discussion, though I'll try to pick it up and get back to you if I have any thoughts. Meanwhile, perhaps Nate or one of our other Thucydidean colleagues may be able to comment. Thanks for the reply. There are several threads. At the moment, the main question on the table is just what is going on in the Thucydides example in Smyth 2532. [edited] Sorry. I confused between some idioms with ἅλλα and καί. John, I'm afraid that we are probably going to have to reverse ourselves with respect to κατοικέω. ἡμῶν δὲ ὅσοι μὲν Ἀθηναίοις ἤδη ἐνηλλάγησαν οὐχὶ διδαχῆς δέονται ὥστε φυλάξασθαι αὐτούς: τοὺς δὲ τὴν μεσόγειαν μᾶλλον καὶ μὴ ἐν πόρῳ κατῳκημένους εἰδέναι χρὴ ὅτι, τοῖς κάτω ἢν μὴ ἀμύνωσι, χαλεπωτέραν ἕξουσι τὴν κατακομιδὴν τῶν ὡραίων καὶ πάλιν ἀντίληψιν ὧν ἡ θάλασσα τῇ ἠπείρῳ δίδωσι, καὶ τῶν νῦν λεγομένων μὴ κακοὺς κριτὰς ὡς μὴ προσηκόντων εἶναι, προσδέχεσθαι δέ ποτε, εἰ τὰ κάτω πρόοιντο, κἂν μέχρι σφῶν τὸ δεινὸν προελθεῖν, καὶ περὶ αὑτῶν οὐχ ἧσσον νῦν βουλεύεσθαι. τὴν μεσόγειαν...κατῳκημένους : elsewhere κατῳκῆσθαι has only adverbial designations of place. Cf. ii.96.7; 99. 20; iii.34.2; v.83.13. The acc. would properly require an act. form as in viii.108.19. v. H. proposes to insert κατά. I have no idea how he can cite our 2.96 as an instance where the designation of place is adverbial. Unless he too thinks that μέρη means people. Nate, I thought I might just repeat the core of my thinking about all of this. When you get an instance of osos, it is a relative. As such it has to relate to some other quantity (=its antecedent). Now that antecedent can be explicit. Or it can be implicit. If it is implicit, then it can be implicit in some expression. Or it can be in some demonstrative that has been omitted. Those seem to be the only possibilities. I guess that makes three possibilities although a more refined analysis might subdivide matters a bit. So whenever you are interpreting an osos sentence, you have to lay your cards on the table and specify what the antecedent is. Question: as many as WHAT? Answer: as many as THAT! We can't just fake it and pretend it is an indefinite pronoun. It doesn't just mean "some". LSJ have no examples, as far as I can tell, where it just means "some". English is similar. There is almost always an antecedent. And in both languages the places where we seem to lose sight of an antecedent are in some rare idioms. Now where we put the antecedent makes a difference. When Sitalces is levying troops, is he rounding up As and Bs? Or is he rounding up As and as many Bs? Huge difference. But it's not just about osos. It ends up being about relative clauses in general and different kinds of attraction. I used to dread attraction. Now I'm obsessed with it. I used to fear it. Now it fears me! And this is a good warm up exercise for oios which I think is going to be a lot harder. Last edited by pster on Fri Jan 25, 2013 7:09 pm, edited 1 time in total. 1272, and how you read the sentence in question in light of them? I don't have a reading yet. I've raised a number of questions that need to be answered though in order to have a reading above in the second section @ Thu Jan 24, 2013 1:52 pm . pster wrote: I don't have a reading yet. I've raised a number of questions that need to be answered though in order to have a reading above in the second section @ Thu Jan 24, 2013 1:52 pm . I'll try my best to address them. pster wrote: OK, no more messing around. We can come back to that momentarily. Let's get down to business: Smyth 2532. He explicitly takes up the other ὅσα example from this page of Thucydides. I think we both agree on 1.
and changing its case to that of the relative pronoun, right? were not included in the post-attraction, post-incorporation sentence. We need to find what was the sentence before this attraction has occurred. to be in acc. masc. pl. just as the first two (τούτους) or as acc. neut. pl. (ταῦτα)? And what of ἄλλα? Was it in neut. or masc. pre-attraction? I might just as well be obsessed about all this attraction fiasco. I have been assuming that the accusative in the expanded sentence would be neuter since ἔθνη is neuter. But you have already made a great contribution in forcing me to seriously consider the possibility that it is masculine. That might help with the other sentence. Just so you know, what I really want, what I am working towards, the big enchilada, is to be able to explain the different order of osa and alla in the two sentences. Marchant tells us to compare the the two different formulations, but doesn't tell us what the upshot is. It gets very complicated though. I have even spent four hours on the geography of Thrace in order to get some insight. And as you see, I now think that John and I are mistaken in disagreeing with Marchant and Dionysius of Halicarnassus. That disagreement is important because it relates to the matter of the subject in the relative clause in the other sentence. Yes about incorporation. Smyth takes it up in the 2500's. Was ἔθνη Παιονικὰ orginally outside in the main clause, unicorporated? If so, then we wouldn't need a demonstrative. Or maybe just ἔθνη was outside? Or, given that incorporated things go towards the back of relative clauses, maybe Παιονικὰ was outside? This raises a fascinating point. With basic relative pronouns, the gender can't change because the object referred to by the antecedent and the relative are one and the same. Attraction doesn't change gender. But with osos, it seems as though perhaps it can change: For the dance, we need so many women, as many as there are men. Or: For the dance, we need so many women, as many men as will come. Or: As many men as will come, we need so many women. If we put those in Greek, and used a feminine demonstrative for our antecedent, "so many women", then carried out attraction, we would perhaps have to address the question of the gender of osos! It really looks as though in the last case, the demonstrative and the relative have different genders!!! Who wins the battle of the sexes?? Last edited by pster on Fri Jan 25, 2013 7:51 pm, edited 1 time in total. Yet more questions that rise up from reading this sentence. My only problem with this is the quite common reading of ὅσα as if it were πάντα ἅ.
I actually like that third possiblity the least. I don't think we can change the gender of ἄλλα. The reason I brought up the Smyth section on ἄλλα is because it points out how without the article ἄλλα gets read by apposition. So that I thought gave me a convenient reason to keep it outside. Incorporation takes in Paeonian tribes, but not the ἄλλα in apposition. That was my thinking anyway. I can ramble on quite a bit. I think that I have demonstrated that pretty well in fact! But I am more interested in seeing what you come up with at this point. One refers to a set. The other refers to the number of elements in that same set. pster wrote: John, I'm afraid that we are probably going to have to reverse ourselves with respect to κατοικέω. pster - many thanks for this. I've done a bit more digging, and elsewhere, as far as I can see, Thucydides only uses the verb (active and middle) of people, not passively of places being settled; moreover, if you look ahead to 2.99.5, you will see βραχὺ δέ τι αὐτῶν περὶ Φύσκαν κατῴκηται, '... but a small part of them settled near Physca', which also supports your suggestion. So thanks again for pointing this out . It looks as if the ancient scholiast, who commented on 2.96 that μέρη = γένη (ἐθνῶν), was right after all! John, before we close the question. Do you have any thoughts as to why he uses the pluperfect? It seems doubly odd because here in 2.96.1 the main clause verb is the (historical?) present ἀνίστησιν while it is only later in 2.96.3 that he switches to the imperfect ἀνίστη. How then do you read ἄλλα as apposition? What would be as literal as possible rendering of it? seeing we're talking about the neuter. I don't get the distinction, since you eventually get to the same meaning as that of panta tauta a P.
I didn't understand the motivation for it exactly, but this was your original question regarding "all". Sometimes in Greek and English you can substitute the one expression for the other. Sometimes you can't. It depends on what is going on in the sentence and the context. I want so many beers, as many beers as are cold. I want all the beers that are cold. I want so many beers, as many beers as Bob has. I want all the beers as Bob has. In English and Greek, the first pair are usually interchangeable. But the second pair are not. You don't want Bob's beers, you just want as many as he has. The context and the exact form of the sentence are going to determine whether they are interchangeable. Indeed, if you call in the philosophers, they will easily construct contexts in which the first pair aren't even interchangeable. I'm not quite defending apposition. As I say I don't have a reading. I mention it because Smyth seemed to say that we should expect incorporation in these copula examples. But the alla wasn't incorporated. That seemed to be a big obstacle for incorporation. Then I looked closer at Smyth on alla. As he says, we can translate it, "besides", "moreover", "as well". But that is for readable English. If it really is apposition, then I'm going to use "others" and a comma if need be. Let me try expanded English and see how it goes. Context is important. The Agrianians and the Laeaeans are Paeonian tribes. In addtion, there are some other Paeonian tribes that Sitalces rules. But he doesn't rule them all. Naturally, going to war, he is going to levy all the ones he rules. That is the context. And that is what Thucydides wants to tell us with these subordinate clauses. I think it reads better without incorporation. But one good thing about incorporation is that since tribes is neuter, we don't have any gender question. Here without incorporation we are left with the weird question of what gender to use for "others". And even what is it referring to? If you make it masc. pl. to refer to people, then the logic of it isn't really correct. We have so many other men, then we have as many tribes. Ugh. It's just like in indirect discourse, they talk about the form of the direct discourse, but it often seemed to me that there was more than one possible direct form. pster wrote: I didn't understand the motivation for it exactly, but this was your original question regarding "all". Sometimes in Greek and English you can substitute the one expression for the other. Sometimes you can't. It depends on what is going on in the sentence and the context. pster - I don't think that, in idiomatic English, one could ever say 'I want so many beers, as many beers as are cold'. Surely one would say either 'I want all the beers that are cold' or (less commonly) 'I want as many beers as are cold'. In the latter case the 'as many ... as ...' construction does everything necessary; putting 'so many' in front of it sounds like an attempt to impose on English a τοσαῦτα ... ὅσα construction. With regard to your second pair, again one couldn't actually say in English 'I want so many beers, as many beers as Bob has' - realistically it would just be 'I want as many beers as Bob has'. But of course you're right about the difference in meaning between this and 'I want all the beers Bob has'. As far as I'm aware (and without checking), in Thucydides the ὅσα construction we're discussing carries the second meaning, i.e. referring to the specific items in question, rather than simply to another set of the same number. Last edited by John W. on Sat Jan 26, 2013 2:04 pm, edited 1 time in total. pster wrote: John, before we close the question. Do you have any thoughts as to why he uses the pluperfect? It seems doubly odd because here in 2.96.1 the main clause verb is the (historical?) present ἀνίστησιν while it is only later in 2.96.3 that he switches to the imperfect ἀνίστη. I assume that the pluperfect just signifies 'had settled' (which is tantamount to 'were dwelling'). The historic present of course relates to the specific action being principally described, and does not seem to colour the use of the pluperfect. Do you have any other thoughts on this? I think there's a fairly recent study of the use of the historic present in Thucydides, which presumably touches on its interplay with other adjacent verb tenses - possibly another title for the reading list . pster wrote: I'm not quite defending apposition. As I say I don't have a reading. I mention it because Smyth seemed to say that we should expect incorporation in these copula examples. But the alla wasn't incorporated. That seemed to be a big obstacle for incorporation. Then I looked closer at Smyth on alla. As he says, we can translate it, "besides", "moreover", "as well". But that is for readable English. If it really is apposition, then I'm going to use "others" and a comma if need be. But wouldn't invoking Smyth 1272 require that our Thuc. sentence include the article with alla? His examples in this section surely suggest it. John, in these discussions, what we count as idiomatic English is not always clear, at least to me. If 90% of the population is incapable of formulating a sentence, does that make it unidiomatic? (Truth be told, I'm actually a fairly strong believer in idiolects.) Now, of course you are right about "I want all the beers that are cold" being the usual formulation for short sentences like these. But when the clauses get longer or we move to the genitive and the dative, then shoehorning them into this usual formulation makes the thought unintelligible and often simply doesn't work. Then we have to revert to the demonstrative in one clause and the relative in the other. Thus: As many rooms as the lady wants ready for the event, so many wet bars will need to be immediately ordered to ensure their arrival from the mainland in time, and so many qualified bartenders will need to be hired. And the sentences get even longer. And there are no usual idioms. In these longer sentences, we begin where we begin and we use our command of the language to drive on through to make our point precisely. And Thucydides' sentences are even longer. As for your second point, I am skeptical. The Polybius example that started this whole affair would be a counterexample if the one historian were the other. Indeed, almost all the adverbial examples are going to be counterexamples. In so far as she needed money, I believe that she was capable of murder. Last edited by pster on Sat Jan 26, 2013 5:45 pm, edited 3 times in total. NateD26 wrote: But wouldn't invoking Smyth 1272 require that our Thuc. sentence include the article with alla? You are right. I must be getting old. I thought that those examples excluded the article. OK, I'm going to check LSJ. :pl., ἄλλοι when the several parties are pl., “λείπουσι τὸν λόφον . . ἄλλοι ἄλλοθεν” X.An.1.10.13. I guess this suggests that alla refers to tribes. I am moving towards the view that in the first osa instance osa and alla are in the opposite order because what Thucydides is actually saying is that the number of Getae and the number of other μέρη that were levied were about the same. I think I can justify it with maps if not with population counts. What is that French expression? Better the interesting and false than the boring and true? pster wrote: I am moving towards the view that in the first osa instance osa and alla are in the opposite order because what Thucydides is actually saying is that the number of Getae and the number of other μέρη that were levied were about the same. I think I can justify it with maps if not with population counts. OK, this was probably a pipe dream. More promising development. The alla in the two sentences are different. In the first sentence, the alla are not Getae. In the second sentence, the alla, like the Agrianes and Laeaeans, are Paeonians. I think this is true and very important. And if it turns out to false in some way, then it will be even more important. When you move alla to the right of osa, the predicate in the relative clause can only apply to the others. If alla is to the left of osa, then the predicate in the relative clause can still apply to all the parties. Gentlemen, I think I, and you, will soon be able to sleep peacefully. gradually cleared of the horsemen, till at last they were all gone. Sometime later today or probably tomorrow I will put up a detailed reading of 2.96, hopefully addressing all possible questions that one might have in light of Smyth. I am working on tying up the half dozen or so loose ends. But there may be one or two tangential questions remaining. 1) Thucydides uses osos a great deal, every other page, if not every page. 2) The adverbial uses are extremely common. Probably the first thing you should do when confronted with oson, or osa, is figure out whether it is adverbial. 4) Less common are non-identical objects examples. For example, we get datives of degree in Th. 8.84: τῶν γὰρ Συρακοσίων καὶ Θουρίων ὅσῳ μάλιστα καὶ ἐλεύθεροι ἦσαν τὸ πλῆθος οἱ ναῦται, τοσούτῳ καὶ θρασύτατα προσπεσόντες τὸν μισθὸν ἀπῄτουν. 5) Also less common, but important, are more or less idiomatic examples where it means "sufficient". I am going to take more time with the loose ends than I anticipated. So it may be a week before I post my view of what is going on. In the meantime, here are some other places where one or the other of the expressions occurs, some places where commentators have seemed to assert that the expressions are interchangeable (a literally illogical view which I do not hold), and Dion. Hal. who uses/mentions it. There is somebody whom everybody loves. By simply changing the order of the quantifiers, we get two very different propositions. Whenever you have subordinate clauses, scope questions are in play. One hears people say "which" all the time when they really mean "that". Such people are oblivious to the scope of their subordinate clauses. My very first thought when I saw the reversed word order was that it was a scope difference. But my insecurity about all the Greek caused me to delay investigating it. So when I said "literally illogical", I just meant that as a matter of logic one should expect different propositions. Sometimes they will come out the same, but that has to be shown, and is typically heavily context dependent. Marchant and Smith (I think one just follows the other.) just assert it and indeed, I think they misread the sentences somewhat.